Lee was very easy to deal with and his work is a very high standard. 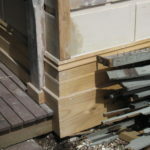 He replaced the facia boards and weatherboards on my 100 year old house. The pricing was reasonable and his communication throughout the project was fantastic.